It has been revealed lately that Facebook has handed out personal information to Cambridge Analytica - the company that allegedly handled Donald Trump's campaign. Now these data are somewhat personal and gathered in times where people had no idea of privacy and from people who do not care. Now they have started caring and are shocked. Facebook have asked CA to delete the data they handed out in 2015 - which did not happen. Facebook is all against abusing personal date at least when they are not the ones using them. People are outraged about FB and are tweeting about deleting their Facebook accounts. This is not an easy thing to do since many have used FB to log in on countless services so that poses a problem. From personal experience I know that it is a problem to break off the registration after having read the Terms - and not accepting them! Facebook simply had no routine for that and treated me as a registered user - in terms of spamming and "friends" request. Most people push Enter and have no clue that they have sold their first born child ; and for that FB worked just fine. Why there is a special outcry now? Well Donald Trump and Senator Ted Cruz seem to have that effect. Facebook shares are down 9 points and that is taken seriously by Facebook. Politicians in Europe and the US demand that Zuckerberg shall explain this and are very unhappy with this. Zuckerberg may lean back and simply state that they should be able to read - because his terms are horrible and they have accepted them. So the only news here is that people have discovered the Facebook terms and the Facebook way. This is now called the Facebook privacy scandal...It can be convincingly argued that Facebook always has been a privacy scandal. Hell... F-Book is run by spooks. 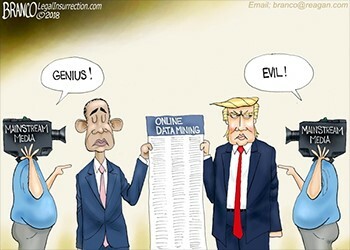 They did the same with O'Bummer's campaign... everybody's data is for harvesting and sell. Sure is...but now maybe some more "nothing to hide" people become aware. Even if you have nothing to hide-hide it! It's called privacy and it is a human right! Some of the Data Miners were agencies selling their services by fooling people. They used applications that mined the information from the user and friends. Is legal in a way... when the application is about to install, it prey on the users ignorance. By checking OK and not reading the EULA and/or pay attention to the warnings (the app is tapping on contacts, GPS, Email, etc...). The application was able to spy and report back to the mothership. Again, the info was not really stolen, was given by the feeble minded users. Stay off this garbage if you want privacy. Funny though... this data mining was used during the O'bummer administration and nobody said a word. When some other company does it and sold the info to the other candiate, is called evil. Well... the cartoon cannot say it better. Last edited by R_Head on 26 Mar 2018, 00:46, edited 3 times in total. As soon as I can get time to sort some things, I am leaving fb and going Ello. On top of the Cambridge Analytica stuff, I have had several good friends who have died, one just today, and Facebook has become a huge source of pain for me. Ello is more artist-centric which is more up my alley, and doesn't do ads, neither do they sell information there. I'm just done with Facebook, and have already stopped posting. Well.... My Space was the 1st "Social Media Club" and people migrated to F-Book, now they poisoned by getting in bed with the "Intel Community". Ello.... give it few more years, it will turn in the quagmire that F-Book is now. What about Diaspora? My understanding is a decentralized system. In another words.... you have no ownership of anything if you use the Technology. Diaspora is a bit complicated for me, and Ello has the benefit of being artist-centric. I handle a lot of artists. It's hard enough trying to get them to follow me even to there. I like their privacy policies as well. I don't believe they are in it for Zuck-style b.s. The Policies link is at the bottom. I clicked up Member Data, hadn't seen it before. You can opt out of anything they retain. Ello is a mission-driven Public Benefit Corporation, with a legal obligation to never display paid advertising, sell member data to third parties, or sell our company to anyone that would violate the terms of our Public Benefit Corporation Charter. Oh, and re: Assange, he actually never did have a fb account. GO JULIAN! Anonymous and Wikileaks each have one, though.